Imagine you had the wild desire to travel back in time and help an ancient indigenous culture improve their crop production. You pack your suitcase full of pesticides and fertilizer, both common modern farming tools, and arrive eager to demonstrate their usefulness. If you landed in the midst of the thriving Tiahuanaco culture on the mountain plains of Peru over a thousand years ago, you would find that their agricultural technology far outperforms yours. Thankfully, remnants of these indigenous methods journeyed far into the future and are now helping modern farmers in this region improve their crop yields considerably. In the centuries surrounding the dawn of the Common Era, the Tiahuanaco culture inhabited a region in the Andean mountains near Lake Titicaca. At an elevation of more than 12,000 feet, they used an advanced irrigation system that helped feed a population numbering in the tens of thousands. Unknown to Spanish colonialists and for centuries thereafter, these remarkable techniques were only just recently rediscovered. Clues to this ancient agricultural technology were found in the 1980s by a team of archeologists. Most visible were small undulations found across the plains, indicative of a complex system of canals, irrigation and drainage. As archeologists unearthed this ancient landscape, an understanding of its profound agricultural significance grew. This barren land had been used extensively as farmland, and could possibly be nurtured to promote and sustain life once more. 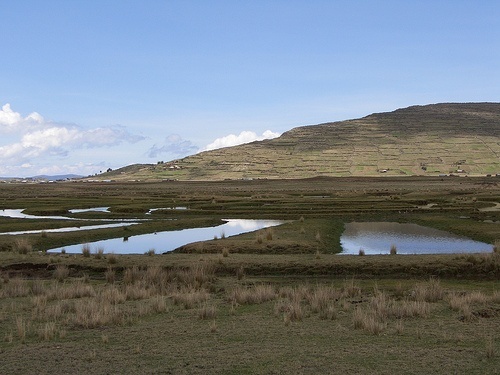 Low-lying land, subject to recurring flooding, poor drainage and frequent droughts characterizes the landscape of the Peruvian mountain plains. Seemingly unfit for productive farming, the technique used by the Tiahuanaco, coined waru waru by the locals, made this a region ripe for cultivation. Using a patterned array of raised earth beds and canals (see opening photo), the Tiahuanaco were able to make the highly salty soil productive and at the same time provide protection from the droughts, frost, and flooding common to the area. These canals are quite literally the life force of this system. When filled with water the canals produce a microclimate that shields surrounding crops from frosts, and provides nourishment during droughts. During rainy seasons, they provide a much needed drainage system. The canals also prevent pests from crawling to and devouring valuable crops. Beginning in 1991, a restoration project began in an effort to reintroduce these techniques in this area to help support and sustain local populations heavily burdened with hunger and poverty. In partnership with local farmers experimental plots were laid to test the efficiency of the technique. The result was potato production three to four times that of previous agricultural efforts, including methods using pesticides and fertilizers. Today, over 100 communities have utilized the waru waru technique to actively farm land previously uncultivated. Not only has it increased productivity and crop security, but the small-scale plots of land used by local communities, as opposed to massive farming areas, have a greatly reduced impact on the surrounding environment. Reclaiming a technique used by their ancient kin enables local farmers to reconnect with their ancestral roots. By doing so, they not only ensure a more prosperous, healthy future for their children, but also provide inspiration for the rest of world to rediscover the enduring wisdom of our indigenous roots. For a detailed description of waru waru cultivation techniques, click here. Read a comprehensive article on raised field agriculture in Bolivia and Peru. Find out how scientific discoveries are uncovering the truth behind ancient wisdom. Explore our commitment to a sustainable future.